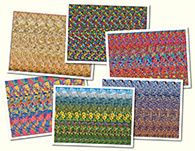 Free Software : Stereogram Images, Games, Video and Software. All Free! Stereogram Lab is the very first program which allowed to render Mapped Texture Stereograms in automatic mode. We are proud to say that it has been using by Gary W. Priester, Gene Levine, Carlos Contreros and Dmiitriy Bessmertniy (3Dimka), and stereograms made with this amazing software were published in following books: Hidden Treasure, 3D Magic History and TJ Mook Magical Eye series. And we are happy that you can have if at no charge at all! 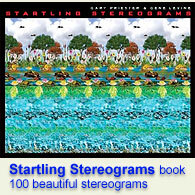 You can use Stereogram Lab MTS 1.0 both for commercial and non-commercial purposes. Stereogram Lab comes with samples of Color and Depth maps, you can try them first. 3. Press F8 key for render options (or use menu->Render->Settings). Press F2 key to save the result, or use autosave option in Render Dialog. Stereogram Lab MTS hasn't been updated for a long time and might not work with latest versions of Windows and PhotoShop. There is alternative software available: Stereographic Suite which includes Stereogram Generator, Texture Maker and Modeler. If you liked Stereogram Lab and willing to support us, please consider making a small donation which will help this site to survive.